نقشه فنیقیه و مسیرهای تجاریش در مدیترانه. فنیقی‌گرایی (انگلیسی: Phoenicianism) شکلی از ملی‌گرایی لبنانی است، که نخستین بار مسیحیان لبنانی، به خصوص مارونی‌ها، در زمان تشکیل لبنان بزرگ اختیار کردند. این باور هویت مردم لبنانی را با فنیقی‌های باستان یکی می‌داند. ↑ El-Husseini, Rola (2012). Pax Syriana: Elite Politics in Postwar Lebanon. Syracuse University Press. p. 199. ISBN 978-0-8156-3304-4. 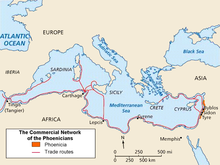 Phoenicianism. The "Phoenicianist" discourse of Lebanese identity was adopted by Christian (primarily Maronite) intellectuals at the time of the creation of Greater Lebanon. The Maronites' stated goal of establishing a Christian refuge in the Middle East was instrumental in convincing the French authorities to designate Lebanon as a separate nation-state. The origin myth adopted by the Christian advocates involved a purportedly independent cultural legacy that was said to have existed in Lebanon since ancient times. مشارکت‌کنندگان ویکی‌پدیا. «Phoenicianism». در دانشنامهٔ ویکی‌پدیای انگلیسی، بازبینی‌شده در ۱۵ مارس ۲۰۱۸. این صفحه آخرین‌بار در ‏۵ مارس ۲۰۱۹ ساعت ‏۱۵:۲۴ ویرایش شده‌است.